Up until yesterday, I had only had contact with a surfboard twice in my life. The first time was in Santa Cruz, CA, with Sam and his brother. The water was freezing, despite the fact it was July and despite the fact we were wearing full wetsuits. Have you heard of that fairly gross but useful tip of peeing in your wetsuit to stay warm? Sam managed to pee in his wetsuit a miraculous 7 times and his lips were still blue and chattering. The Pacific Ocean off the California coast is a bit like a couple of girls I've come across; so much physical beauty but not enjoyable to spend time in close contact with. I never successfully rode a wave in that day. The next time was a year or so later in Kauai for Sam's brother's wedding. I was awkwardly trying to paddle and catch a wave when suddenly a surfer came very close to me. I braced myself for a collision and offered up a hasty apology, cursing myself for being the lame newbie in the path of someone who clearly knew what he was doing. Instead of retorting with an insult, this Patron Saint of Novice Surfers reached down and, from his own board, yanked me by the arm up to my feet. I then rode the wave all the way in, feeling as stable as if I was on land. That was the only wave I caught that day. 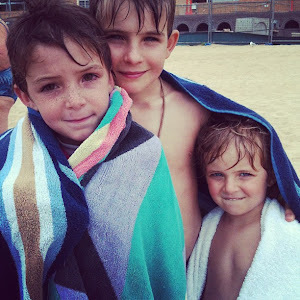 Fast forward eleven years and the creation and addition of three children to the family, and we all found ourselves at Manly Beach for a surfing lesson. Kenyon isn't quite ready for surfing, so we drew names and paired up Sam and Jackson for one lesson while Alex and I took the next one a few weeks later. 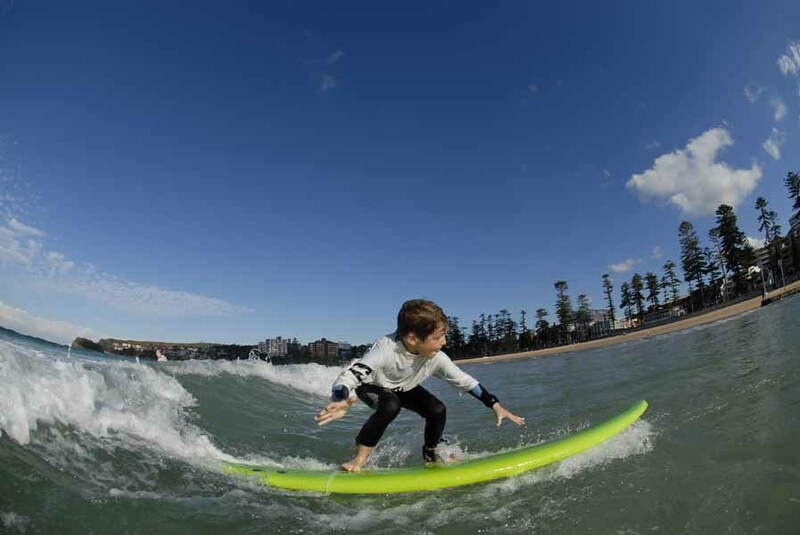 If you're in the area, Manly Surf School is a must for learning to surf. First of all, the trip over is worthwhile--riding the famous ferry from Circular Quay over to Manly gives lovely views of the Harbor Bridge and the Opera House. Manly itself is an adorable town, and the beach itself is tops without feeling the least bit touristy. And the surf school? Awesome all around. ...and how we should hold the board while heading out in the water. Sam grew up boogie boarding and body surfing in Santa Cruz, and he seemed to take to surfing nicely. I had a ball, and got up more times than I could count, so Manly Beach will always hold a special place in my heart. So, how did the kids fare? The way the knowledgeable, friendly instructors worked with my boys was simply stellar. You'd think that being a 7-year old in a class with a bunch of adults would be intimidating, but our instructor boosted Alex's confidence from the start, using him as an example of correct form on the beach and when we first got in the water. At some point in the lesson, Alex and I headed back out to the waves together and, with a huge grin, he told me the instructor said he was 'unreal'. Again, I cannot commend the instructors enough for how exceedingly wonderful they were with my children. Surfing was a good time, and well worth the pain I'm feeling in my arms and chest today. But what really made it special was experiencing it with my family; yet another memory I am grateful for because of this year abroad. Both of my older boys had the good fortune of having the same teacher for the 2-year cycle of kindergarten and first grade. And not just any teacher--the kind of teacher that has the rare ability to fill kids with wonder. The kind of teacher that sets high standards and gives her students the tools to reach them. She's inspiring, supportive, engaging and patient. The kind of teacher where the most painful thing about leaving your home to go live in Australia for a year is the fact your son won't be able to finish first grade with this teacher. Because they attend a public charter school that follows an expeditionary learning model, the students have experiences together that include hiking, camping, rock climbing, snowshoeing, and as they get older, kayaking and mountain biking. Before their first camping trip at the start of the kindergarten year, Alex's teacher read a book called Necks Out For Adventure about a brave clam that dared to think outside the box to save himself and others. It was a perfect story for a group of 5-year olds on the brink of their first camping trip without their parents, or for some, their first night sleeping in a tent. Alex, who has always has a giggle at the ready when he sees clever writing or unique illustrations, loved the book. One of the boys found a clam at the beach while we were camping on this most recent road trip, and brought it back to the campsite. It was closed; the little creature was still in there. I didn't pay attention to it until the morning that we were packing up camp to head out, but the shell opened a teeny bit, despite being out of the water for a couple of days. It was still alive in there. I became fixated on this clam, absolutely desperate to get him back into the ocean, which was a hike away. As we folded up the tent and loaded the car, I found a moist, shady spot in the grass for him. I anxiously asked Sam when we could get going; it just seemed like a shame for him to have made it this long and not get back to where he belonged, and the minutes dragged on until we were finished and set off for our hike. Alex held the clam and had the honor of returning him to the sea--and as he tossed him back into the rolling surf, he yelled, "Stick your neck out for adventure, Little Clammy Boy!". I love that child so much my heart hurts.